RECEPTION HALL With double panel radiator, power points and storage cupboard. BEDROOM ONE 12′ 0" x 12′ 4" (3.66m x 3.78m) With power points, radiator and double glazed window overlooking the front conservatory. 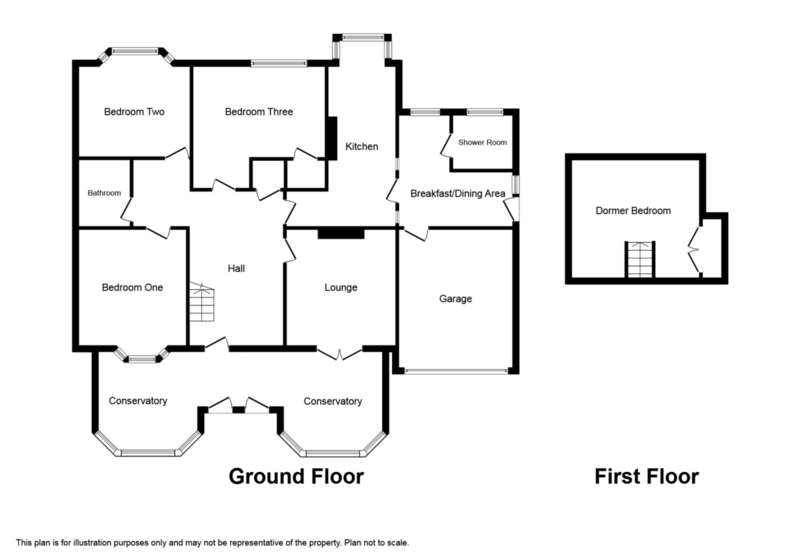 LOUNGE 12′ 4" x 12′ 0" (3.78m x 3.66m) With feature fireplace, power points, coved ceiling, picture rail, double panel radiator and double glazed doors giving access into the front conservatory. BREAKFAST/DINING AREA With radiator, tiled floor, double glazed door giving access to the side, door into integral garage. SHOWER ROOM 6′ 4" x 5′ 8" (1.95m x 1.75m) Having a three piece suite comprising; wash basin with vanity unit, low flush W.C, purpose built shower cubicle and radiator. BEDROOM TWO 11′ 10" x 9′ 11" (3.63m x 3.03m) Having a range of fitted bedroom furniture with window seat, double panel radiator, double glazed bay window giving an aspect over the rear and power points. BEDROOM THREE 9′ 8" x 7′ 11" (2.96m x 2.43m) With double panel radiator, power points, coved ceiling and double glazed window to rear. BATHROOM 8′ 8" x 5′ 1" (2.66m x 1.57m) Having a three piece suite comprising; panelled bath with shower over and privacy curtain, pedestal wash hand basin, low flush W.C, part tiled walls and radiator. DORMER BEDROOM 13′ 8" x 12′ 8" (4.18m x 3.87m) max With power points, radiator, large storage cupboard with hanging space and double glazed window giving an aspect over the rear. DIRECTIONS From our Prestatyn office turn right towards the traffic lights on Gronant Road, proceed to the Coast Road and at ‘Drivers’ turn right onto the main coastal highway the A5548. Continue into Mostyn bearing right just after the Lletty Inn public house, proceed up the hill and the property can be seen on the right hand side. SERVICES Mains electric and water are believed available or connected. Drainage is by way of Septic tank and heating is by way of Oil. All services and appliances not tested by the Selling Agent.